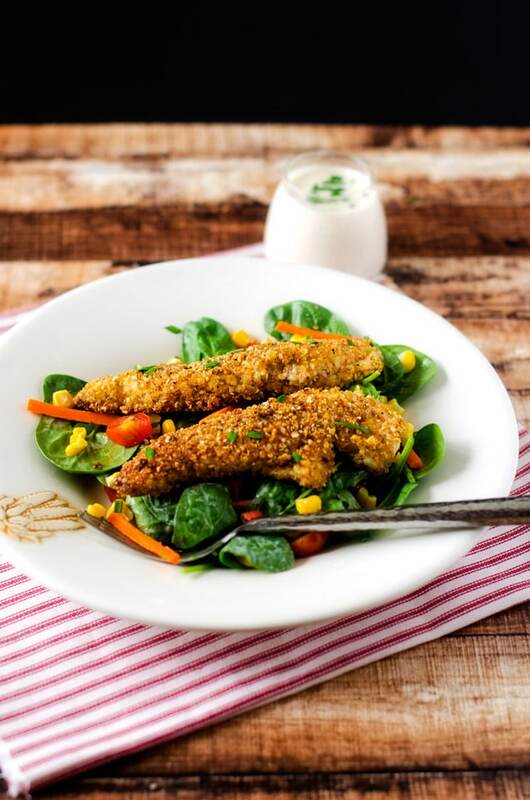 This Quinoa Crusted Chicken is a healthier take on a meal that kids love! The perfect way to balance kid-friendly food with nutrition. There are things in life that you never forget, no matter how much time passes. One of them is my grandmother’s kitchen. When people came to visit, they always came in through the kitchen. To the immediate right, was a deep freezer, which was always stocked with bounty from their enormous garden. Very often, there was a cake or pie resting on it that she had baked that day. My grandmother was never without a sweet treat to offer someone who might drop by! The kitchen also doubled as a laundry room, as the washer and drier were in a closet opposite the back door. I can remember as a child of about seven being away from my parents for the first time to stay overnight with grandma. My grandma went out of her way to make me feel like a big girl, letting me do the laundry while she sat at the kitchen table. Still, it was spacious and the heart of the home. Many happy memories were spent in that kitchen. I still associate the kitchen and food with family and love. There is nothing like Face Time, is there? It was there, at least in part, where I learned to love cooking. She was a great cook, but what I loved best was the time she spent with me. I learned to make fried chicken, cornbread, biscuits and cakes with a precision that only comes from skills being handed down from one generation to the next. We talked about everything. Dolls, school and eventually even boys. My grandmother kept a can of Crisco under the sink that was used for frying. And oh, did we fry! Okra, hush puppies…but my favorite, was her fried chicken. She would often fry it on Sunday’s before church. Dredge, Buttermilk, Dredge, repeat. I can still smell the oil as she carefully worked, making sure that none of us grandchildren got too close. I will never forget what it was like to bite into a perfectly crisp piece of Southern Fried Chicken, juicy, crispy and moist. It was always served with fluffy mashed potatoes, loaded with butter and gravy. My mother continued the tradition, though over time the dish became “healthier” with the addition of a salad with Ranch dressing. These days, my boys too love spending time in the kitchen with grandma, though truth be told I do most of the cooking. There is something special about conversations it the kitchen, and it is my favorite place to connect. In a world that has become so busy, slowing down and getting Face Time in the kitchen (and out!) is something I treasure. My most creative ideas often come while connecting in the kitchen. Recently, my mom has committed to improving her health and I’ve been trying to help her with recipes. One day we were in the kitchen and she mentioned that she’d give anything for her mother’s fried chicken, but that it wouldn’t be on the menu any time soon. Of course, that conversation stuck with me because having had to go gluten free, I know what it is like to want something that you feel like you can never have again. 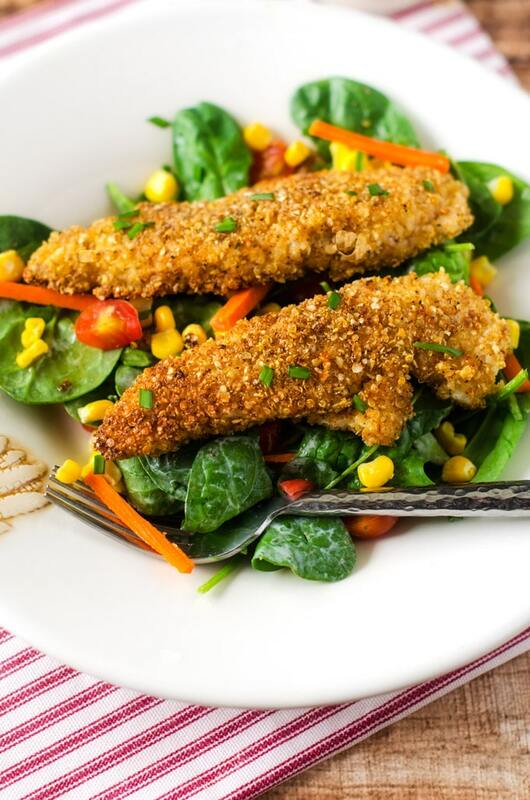 Though nothing will ever compare to my grandmother’s fried chicken, this is a healthier version that I serve over a salad. It’s something I can feel good about feeding my kids. It’s fun being innovative in the kitchen. 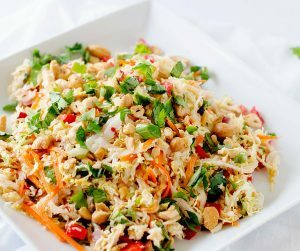 Taking dishes that you’d normally have to reserve for special occasions and making them everyday fare. Grandma would be proud. 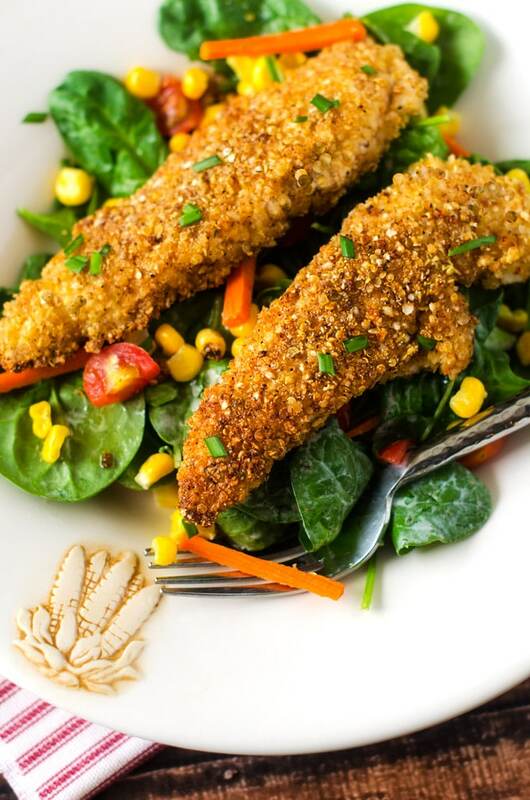 You don't have to give up Fried Chicken to be healthy, just eat this Quinoa Crusted "Fried" Chicken instead! In a large plastic bag, combine chicken, buttermilk and hot pepper sauce. Marinate 8 hours. Line a baking sheet with parchment paper. 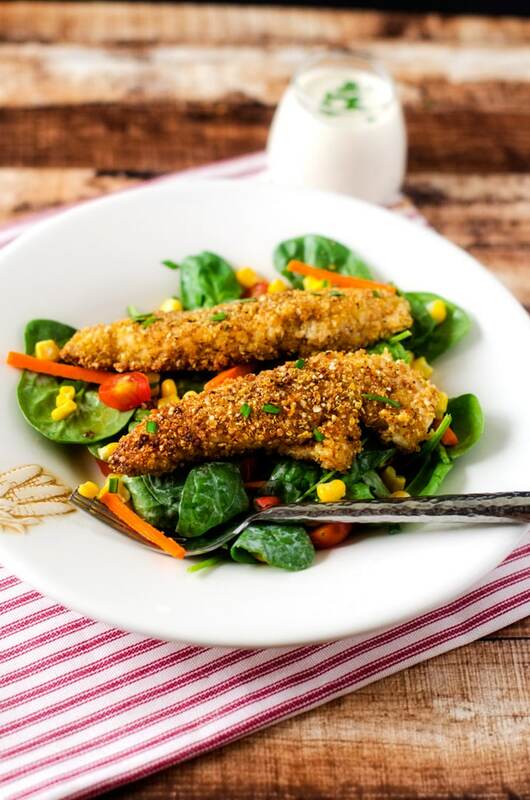 Arrange quinoa and quinoa flakes in a thin layer and bake for 25 minutes. Transfer to a food processor and pulse 3 to 4 times. Transfer to a bowl and stir in paprika, onion powder, cayenne pepper, salt and pepper. 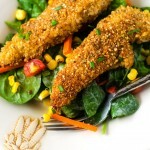 Remove chicken from marinate and coat with quinoa mixture. Heat coconut oil in a large skillet to medium heat and cook chicken until browned on each side, about two minutes per side. Transfer to a rimmed baking dish, being careful not to crowd. Bake for 10 minutes or until done. This recipe is so good, you won't even miss fried chicken. 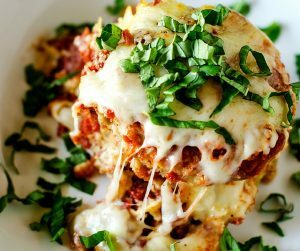 What a brilliant way to use quinoa! I’m looking forward to trying the quinoa fried chicken. The recipe says to use cooked quinoa…would “cooked” mean only roasted in the oven with the flakes? OR actually cooked in water then spread out on the tray to roast? It is cooked normally first.